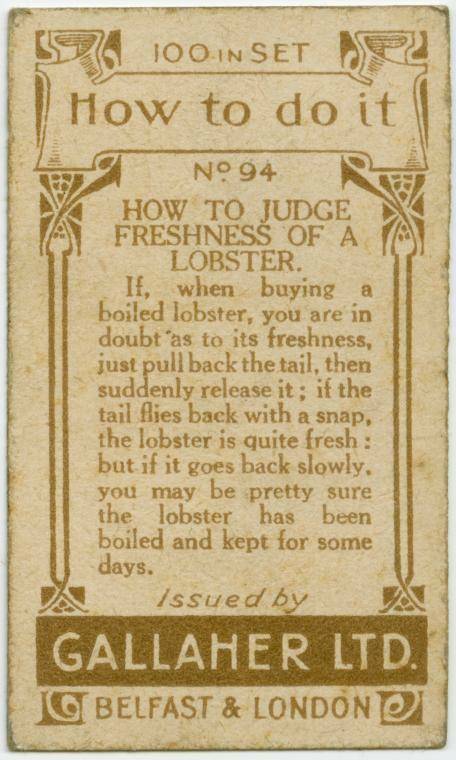 If you think “Life Hacks” are a modern thing only thought up by the internet generation, then think again. 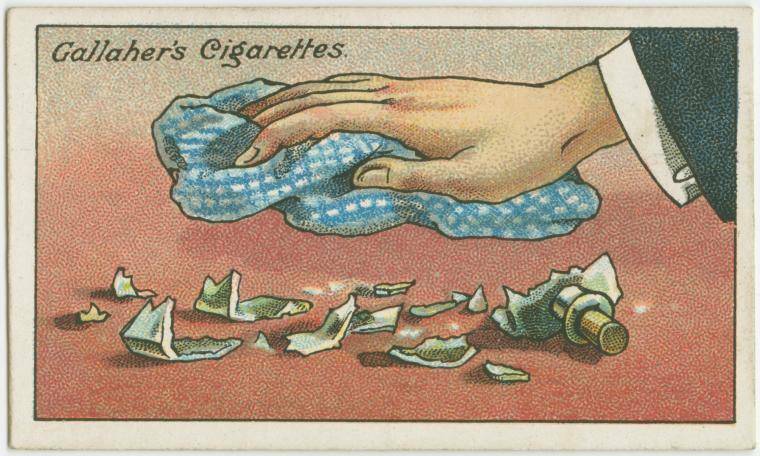 Here’s 22 really old cigarette cards with useful hacks to make your life easier. 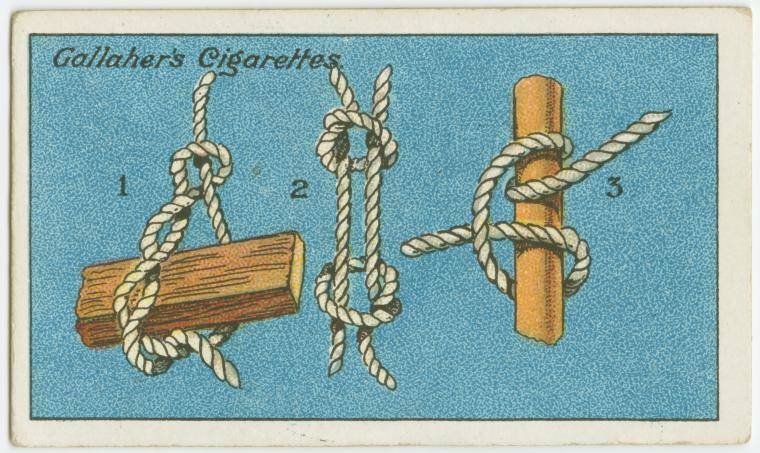 100 year old life hacks that are still really useful in 2015! 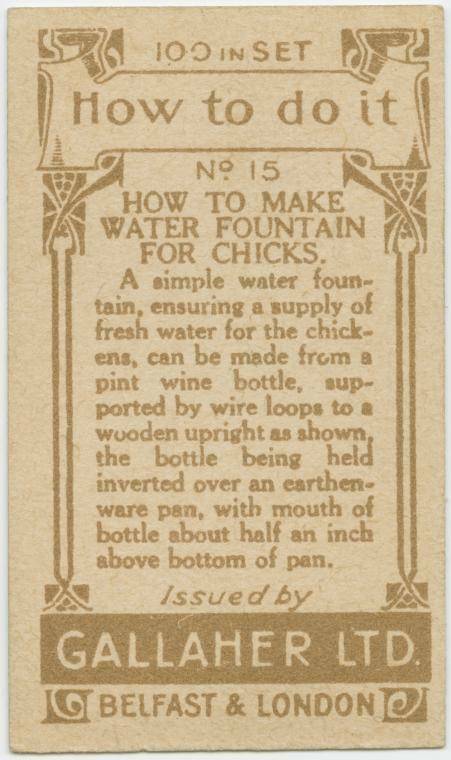 Ok, some won’t get much use now a days, but they can certainly be adapted for today’s modern lifestyles. 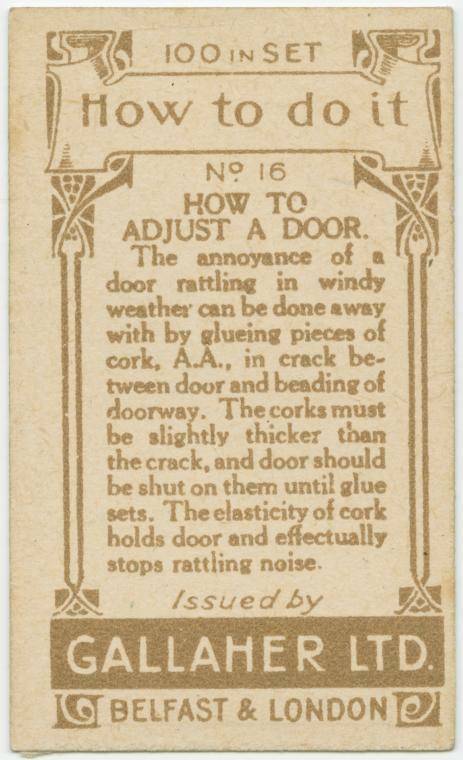 The annoyance of a door rattling in windy weather can be done away with by glueing pieces of cork, A.A., in crack between door and beading of doorway. The corks must be slightly thicker than the crack, and door should be shut on them until glue sets. 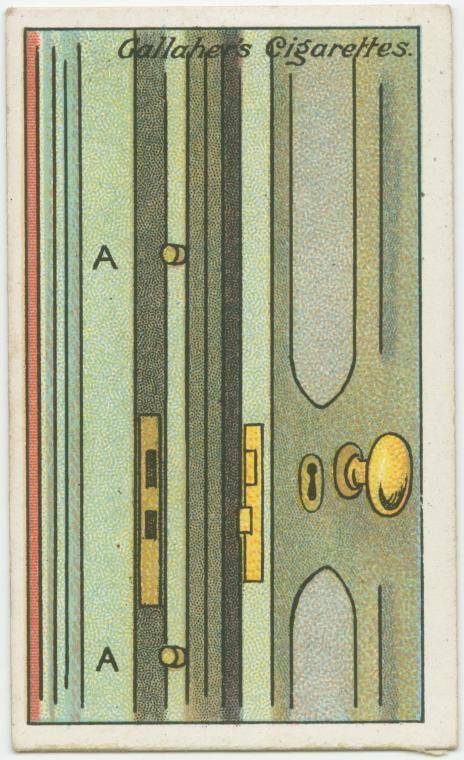 The elasticity of cork holds door and effectually stopd rattling noise. 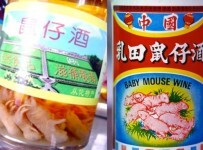 The picture shows a very effective method. 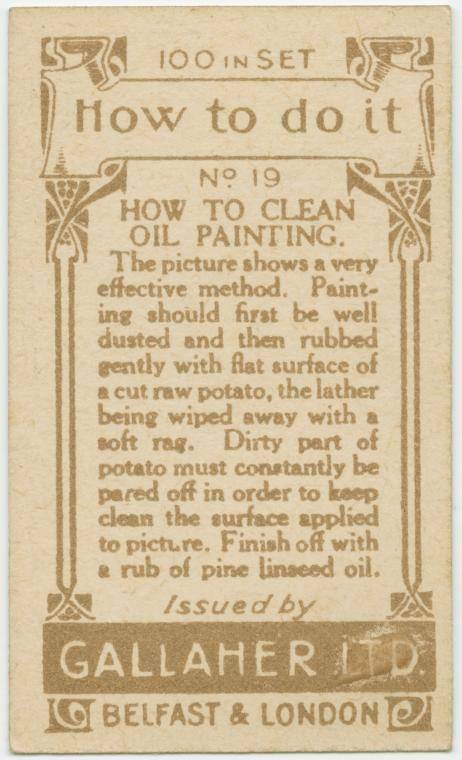 Painting should first be well dusted and then rubbed gently with a flat surface of a cut raw potato, the lather being wiped away with a soft rag. 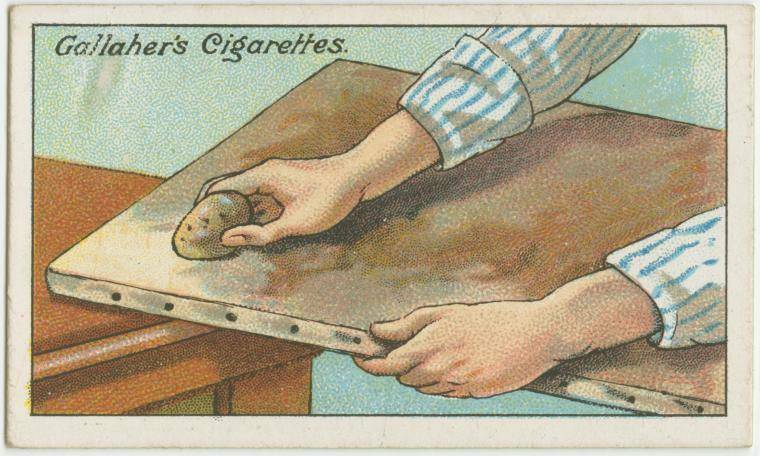 Dirty part of potato must be constantl be pared off in order to keep clean the surface applied to the picture. FInish off with a rub of pine linseed oil. 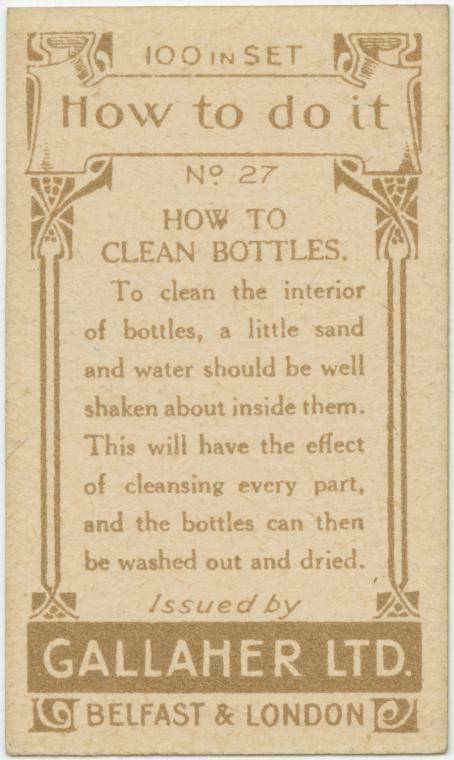 To clean the interior of bottles, a little sand and water should be well shaken about inside them. This will have the effect of cleansing every part, and the bottles can then be washed out and dried. 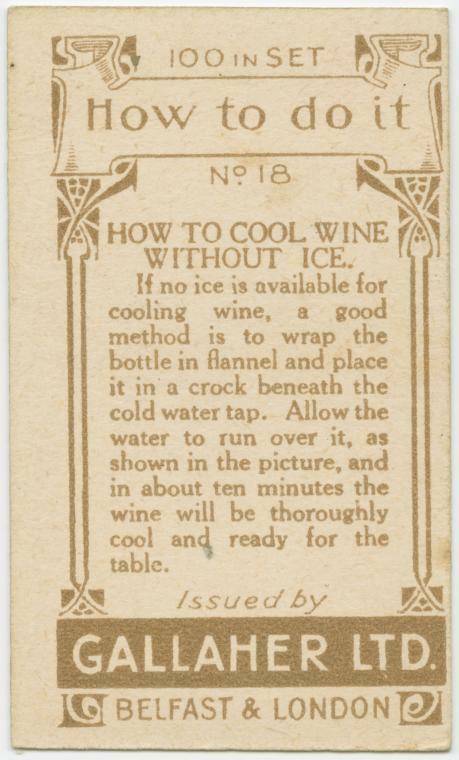 If no ice is available for cooling wine, a good method is to wrap the bottle in flannel and place it in a crock beneath the cold water tap. Allow the water to run over it, as show in the picture, and in about ten minutes the wine will be thoroughly cool and ready for the table. Twist one end of a piece of wire round a pencil and leave the other end straight. 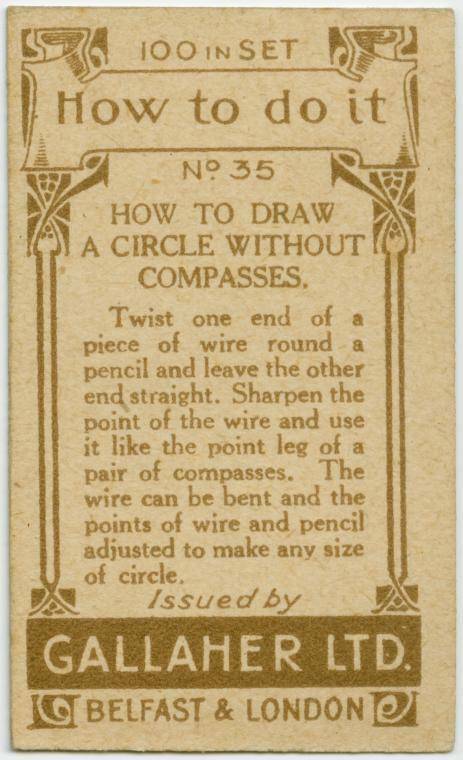 Sharpen the point of the wire and use it like th epoint leg of a pair of compasses. 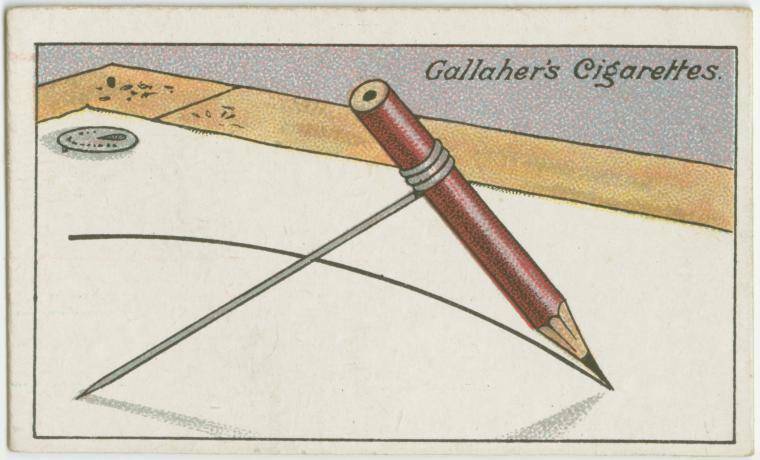 The wire can be bent and the points of wire and pencil adjusted to make any size of circle. 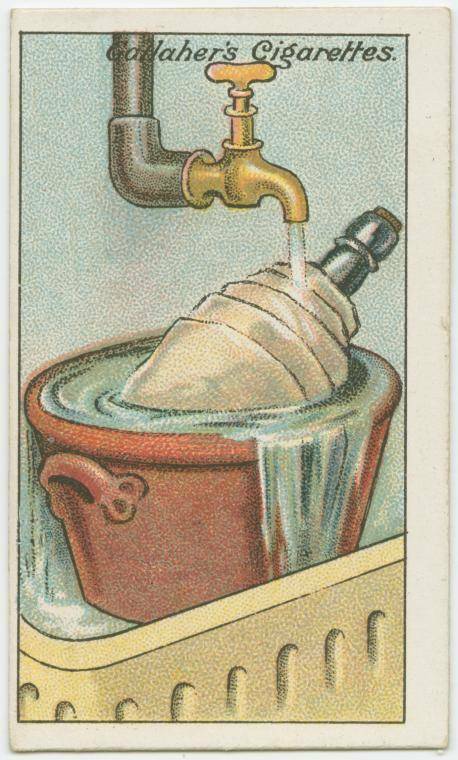 wide-mouthed bottle with hot water nearly to the brim, and press affected part of hand tightly against mouth of bottle. 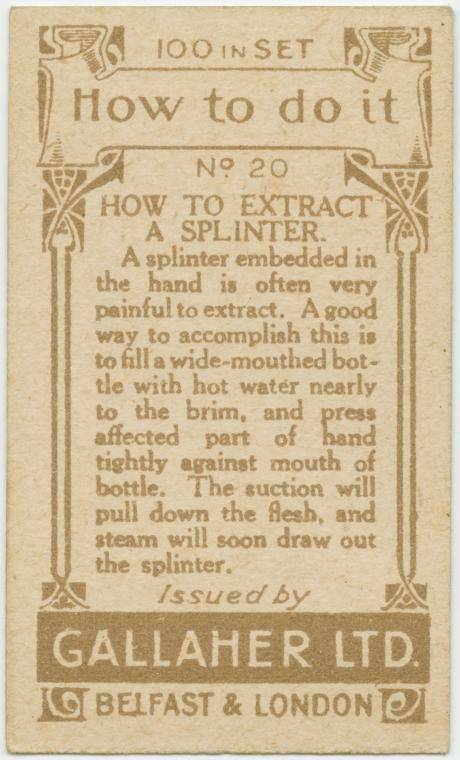 The suction will pull down the flesh , and steam will soon draw out the splinter. 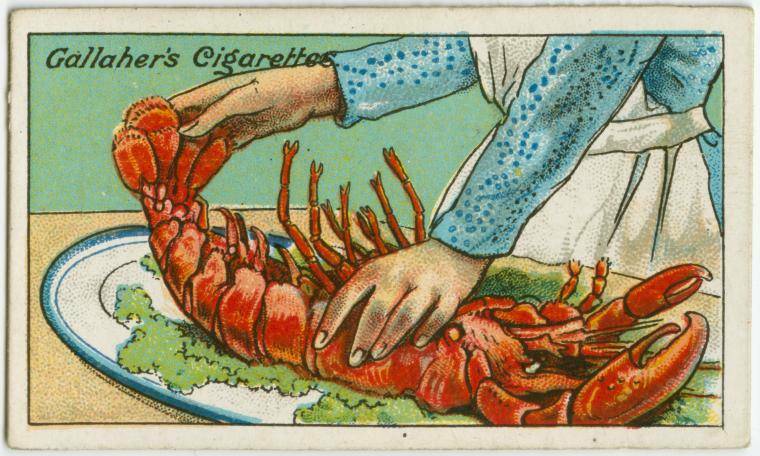 If, when buying a boiled lobster, you are in doubt as to its freshness, just pull back the tail, then suddenly release it ; if the tail flies back with a snap, the lobster is quite fresh: but if it goes back slowly, you may be pretty sure the lobster has been boiled and kept for some says. 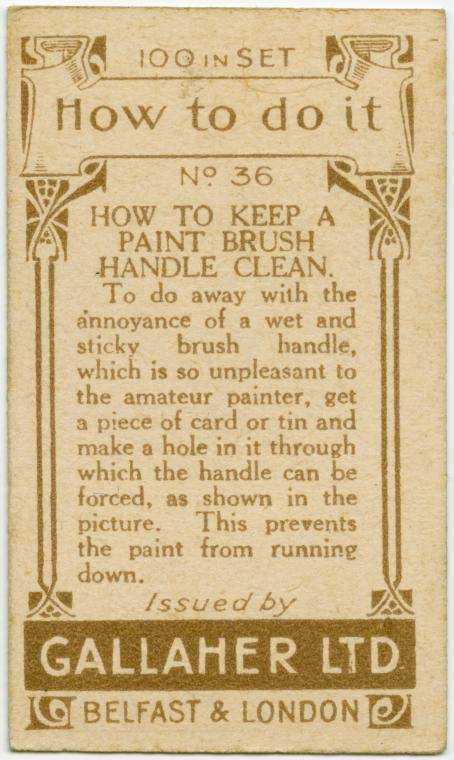 To do away with the annoyance of a wet and sticky brush handle, which is so unpleasant to the amateur painter, get a piece of card or tin and make a hole in it through which the handle can be forced, as shown in the picture. This prevents the paint from running down. 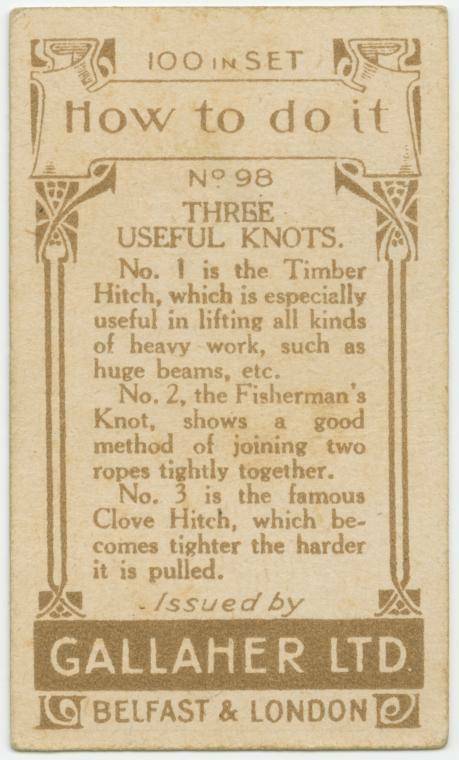 No.1 is the Timber Hitch, which is especially useful in lifting all kinds of heavy work, such as huge beams, etc. 10. How To Pull Out Long Nails. 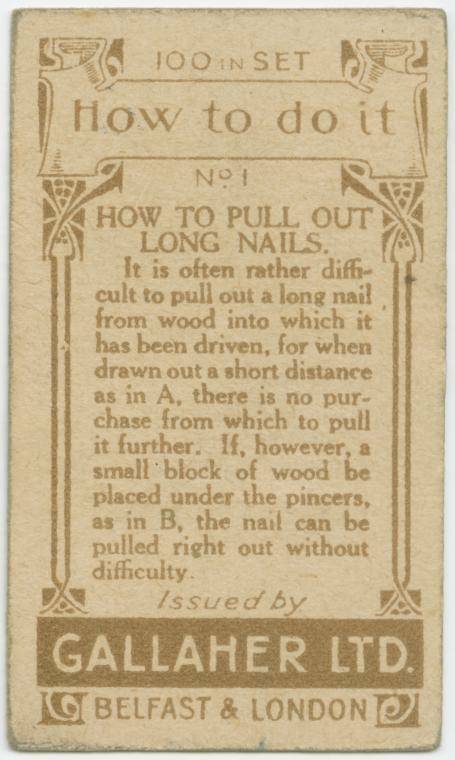 It is often rather difficult to pull out a long nail from wood into which it has been driven, for when drawn out a short distance as in A, there is no purchase from which to pull it further. 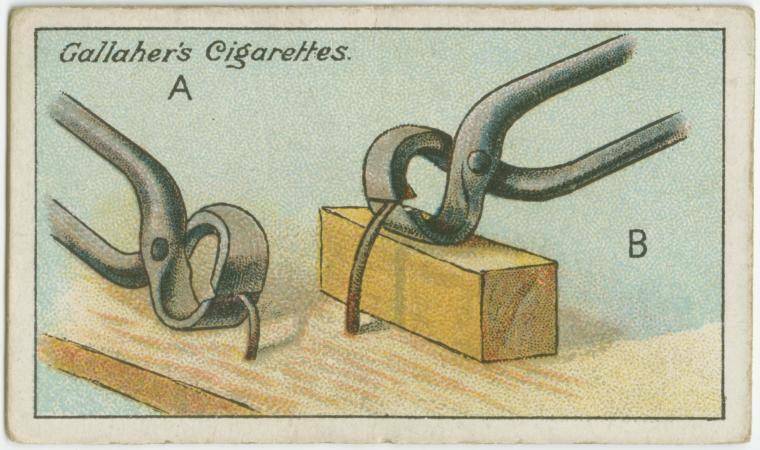 If, however, a small block of wood be placed under the pincers, as in B, the nail can be pulled right out without difficulty. 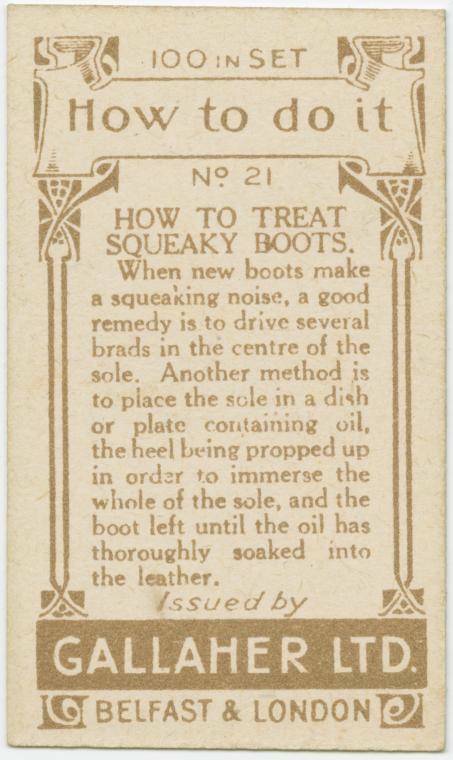 When new boots make a squeaking noise, a good remedy is to drive several brads in the centre of the sole. 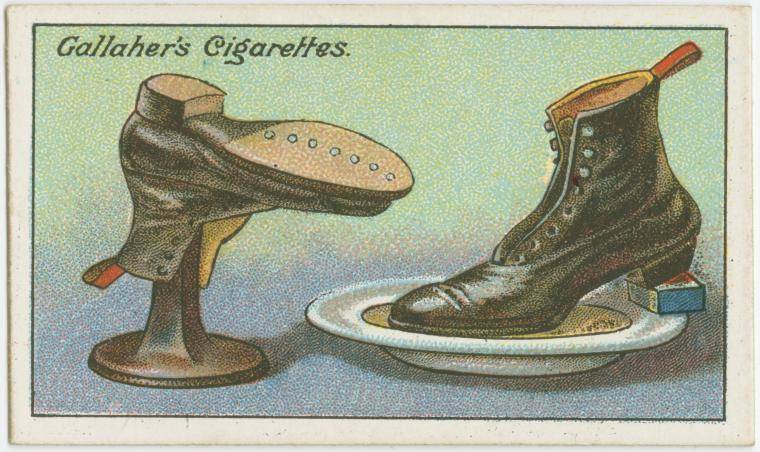 Another method is to place the sole in a dish or place containing oil, the heel being propped up in order to immerse the whole of the sole, and the boot left until the oil has thoroughly soaked into the leather. 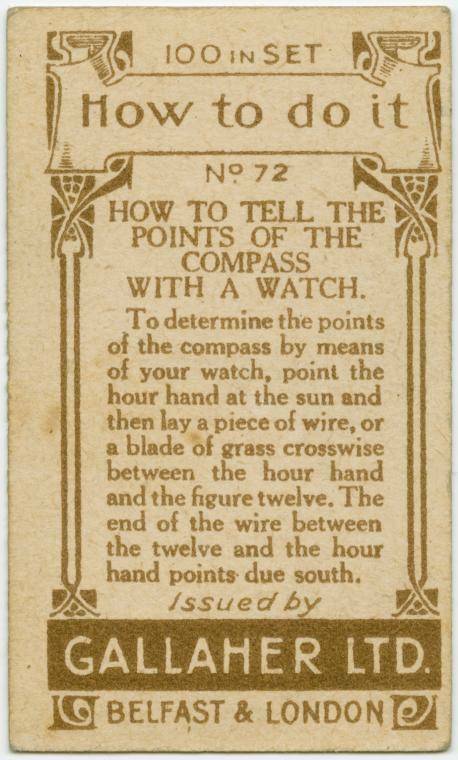 To determine the points of the compass by the means of your watch, point the hour hand at the sun and then lay a piece of wire, or a blade of grass crosswise between the hour hand and the figure twelve. 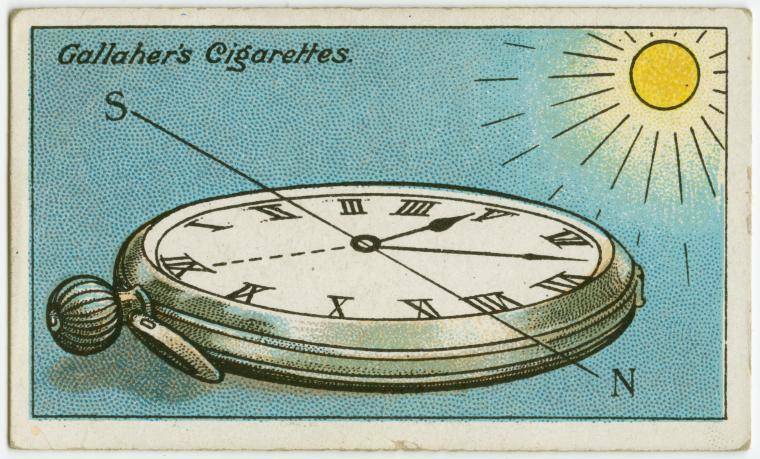 The end of the wire between the twelve and the hour hands points due south. 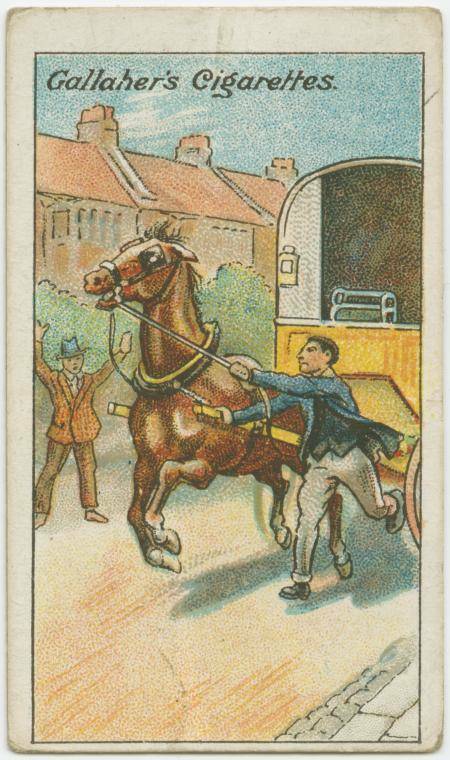 Never rush in front of the horse. 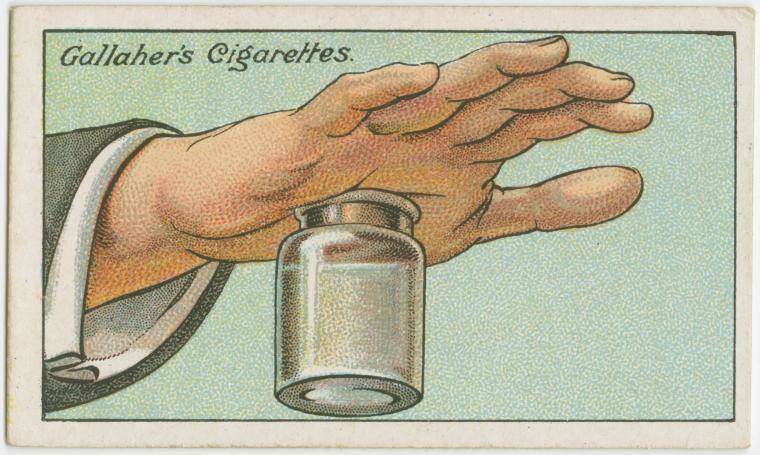 Run along beside, and with the hand nearest, grip the shaft and keep the body clear by the stiffened arm. 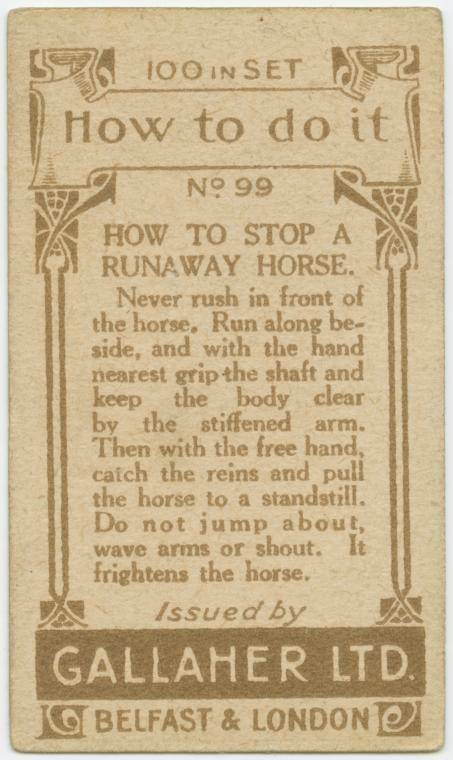 Then with the free hand, catch the reins and pull the horse to a standstill. Do not jump about, wave arms or shout. It frightens the horse. 14. 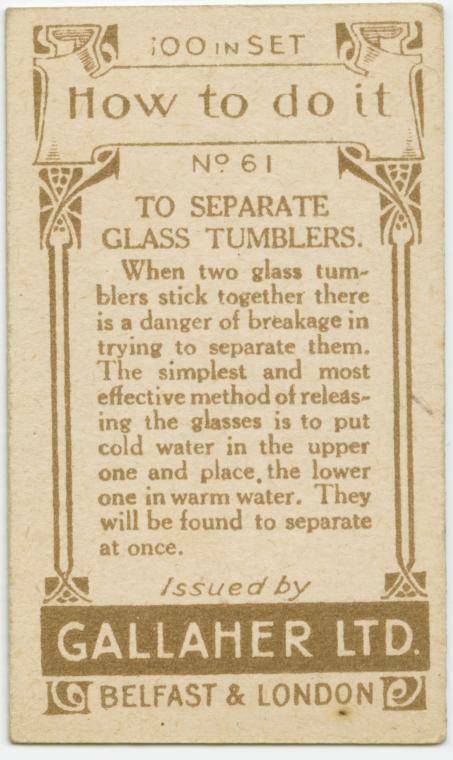 How To Separate Glass Tumblers. When two glass tumblers stick together there is a danger of breakage in trying to separate them. 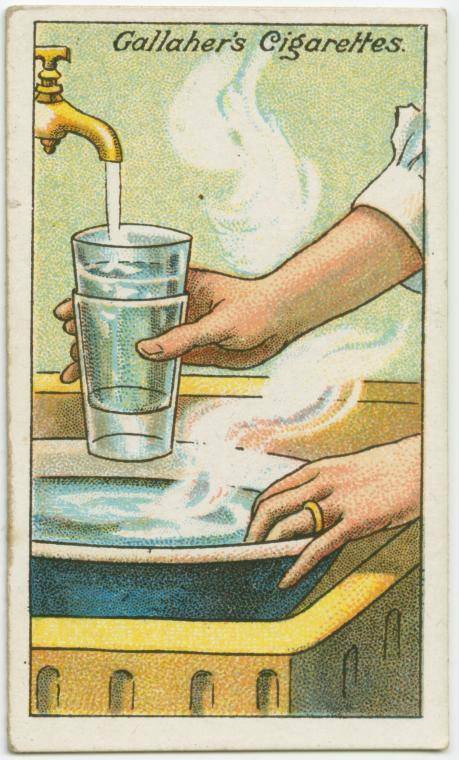 The simplest and most effective method of releasing the glasses is to put cold water in the upper one and place the lower one in warm water. They will be found to separate at once. 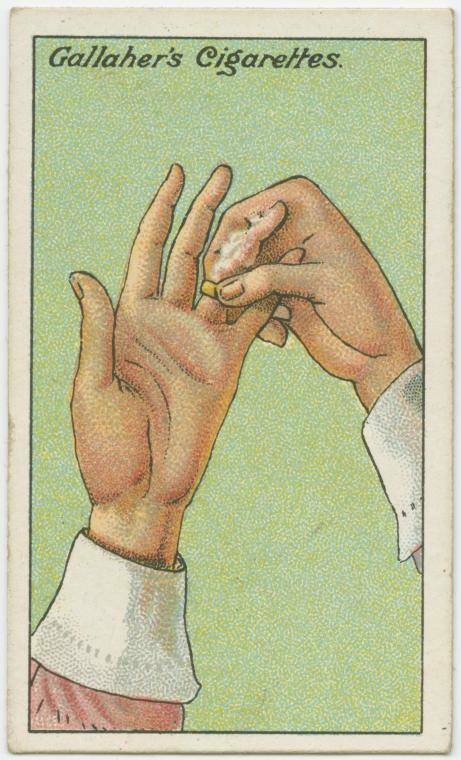 To remove a tight ring from the finger without pain or trouble, the finger should be first well lathered with soap. 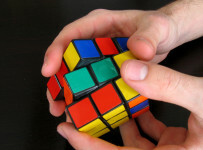 It will the be found that, unless the joints are swollen the ring can easily be taken off. 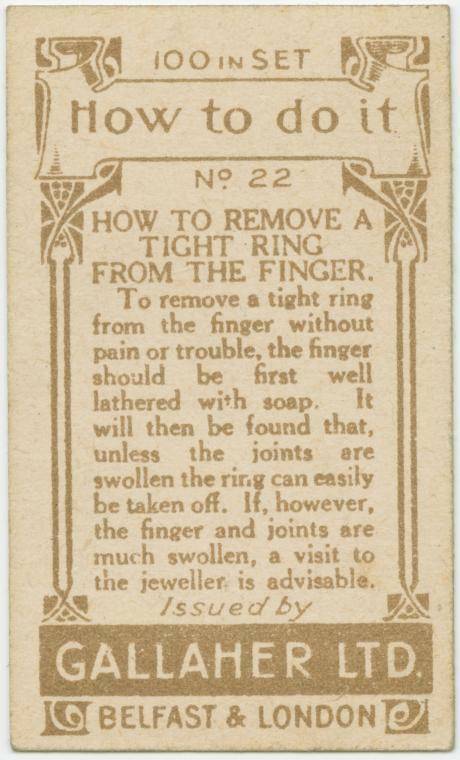 If, however, the finger and joints are much swollen, a visit to the jeweller is advisable. 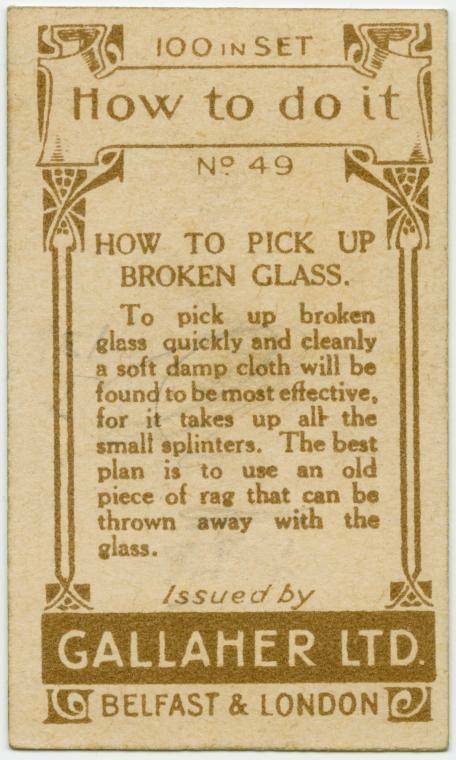 To pick up broken glass quickly and cleanly a soft damp cloth will be found to be most effective, for it takes up all the small splinters. The best plan is to use an old piece of rag that can be thrown away with the glass. 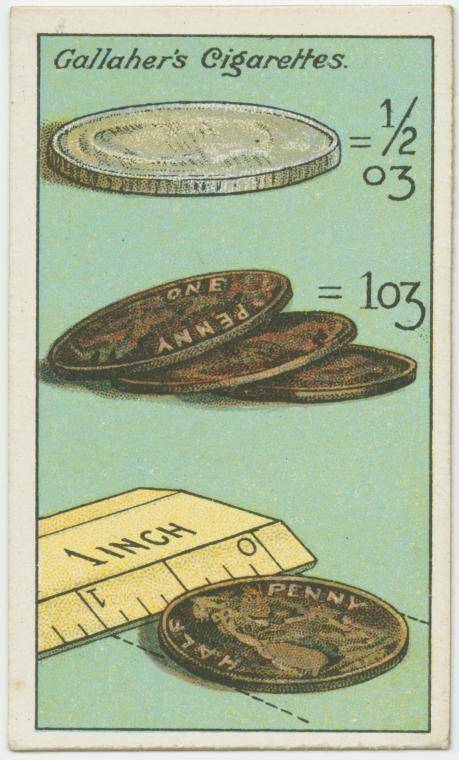 It is sometimes useful to know that half-a-crown equals half an ounce in weight, and three pennies weigh on ounce. 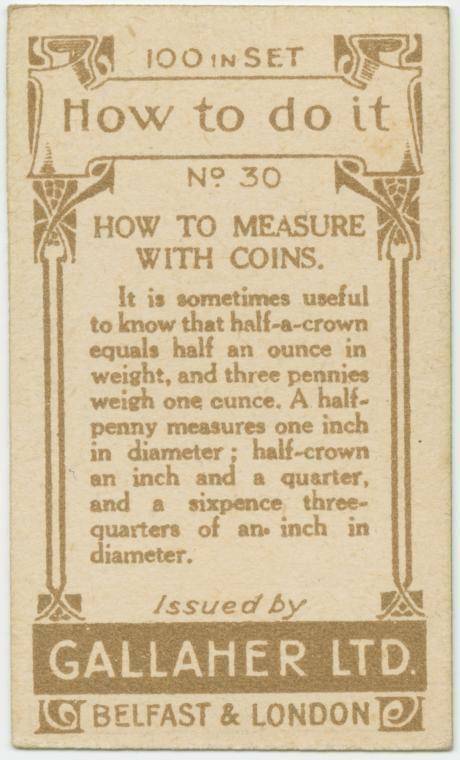 A half-penny measures one inch in diameter; half-crown an inch and a quarter, and a sixpence three quarters of an inch in diameter. 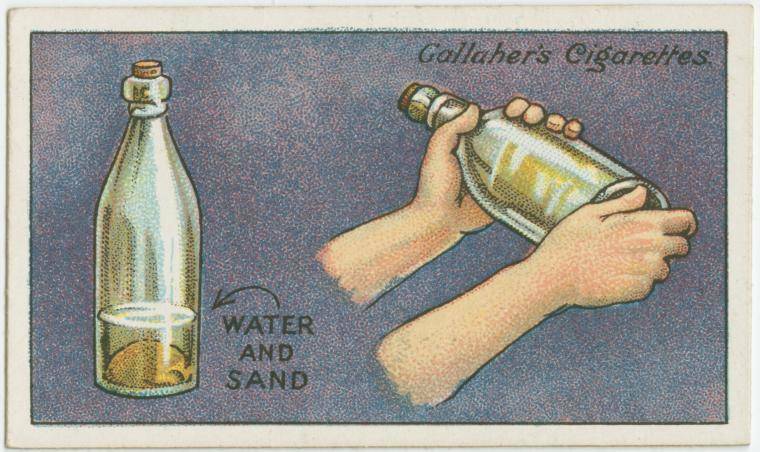 It may happen that the cork is slightly too large for the bottle you wish to fit. 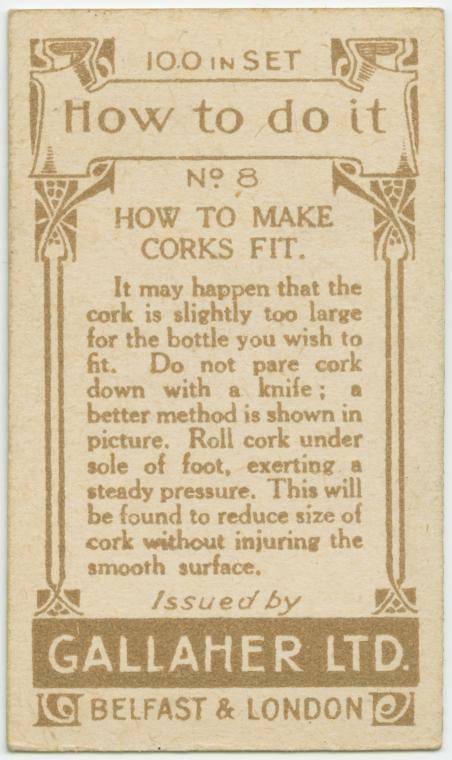 Do not pare cork down with a knife; a better method is shown in picture above. 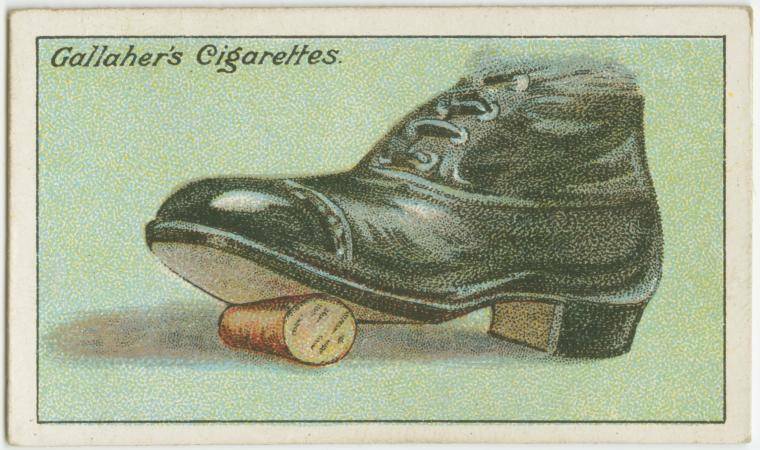 Roll cork under sole of foot, exerting a steady pressure. 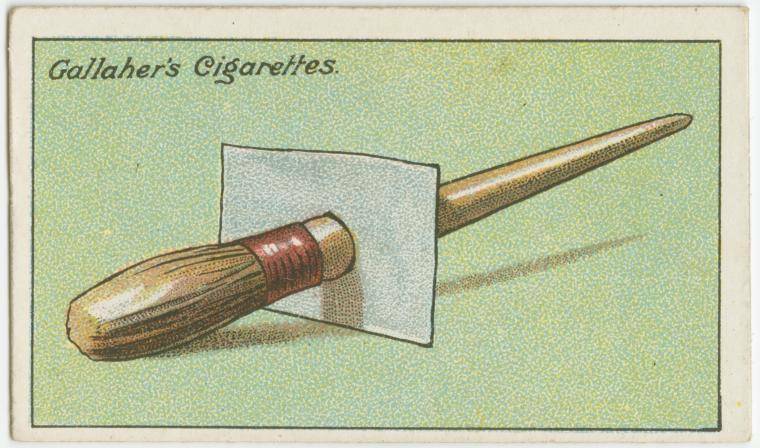 This will be found to reduce size of cork without injuring the smooth surface. 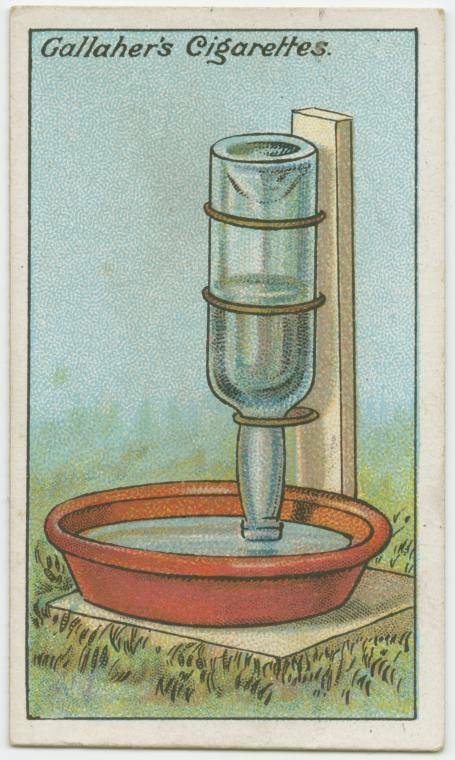 A simple water fountain, ensuring a supply of fresh water for the chickens, can be made form a pint wine bottle, supported by wire loops to a wooden upright as shown, the bottle being held inverted over an earthen-ware pan, with mouth of bottle about half an inch from the bottom of pan. 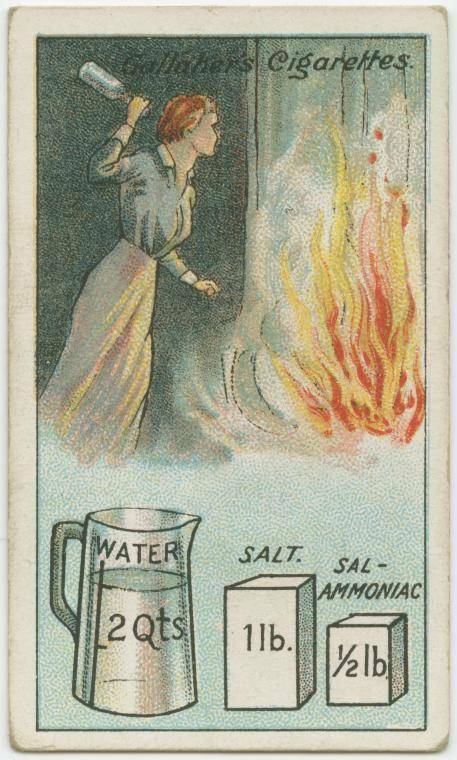 Dissolve one pound of salt and half a pound of sal-ammoniac in two quarts of water and bottle the liquor in thin glass bottles holding about a quart each. 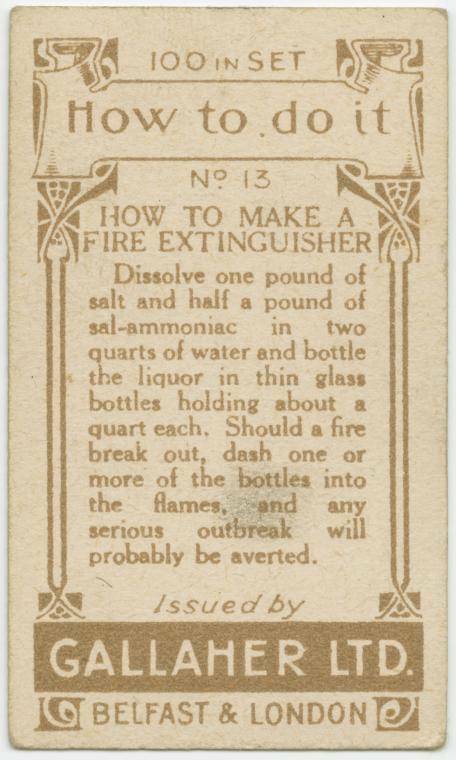 Should a fire break out, dash one or more of the bottles in the plames, and any serious outbreak will probably be averted. 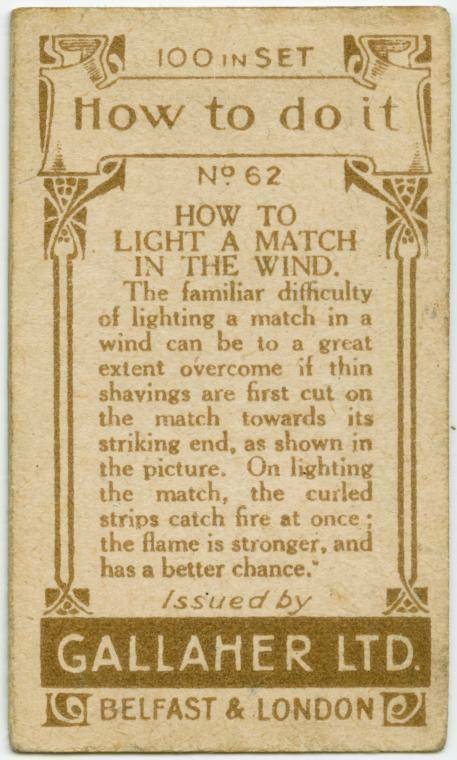 The familiar difficulty of lighting a match in a wind can be to a great extent overcome if thin shavings are first cut on the match towards its striking end, as shown in the picture. 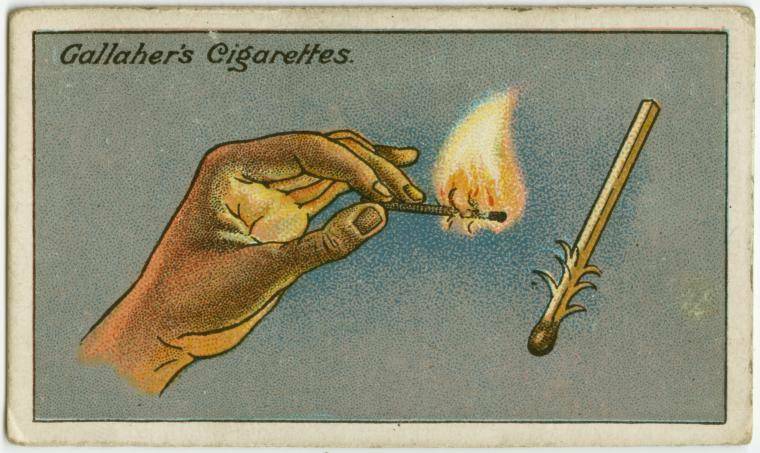 On lighting the match, the curled strips catch fire at once ; the flame is stronger and has a better chance. If a tree stump is not removed from the ground, it often starts sprouting, and strong undergrowth results. 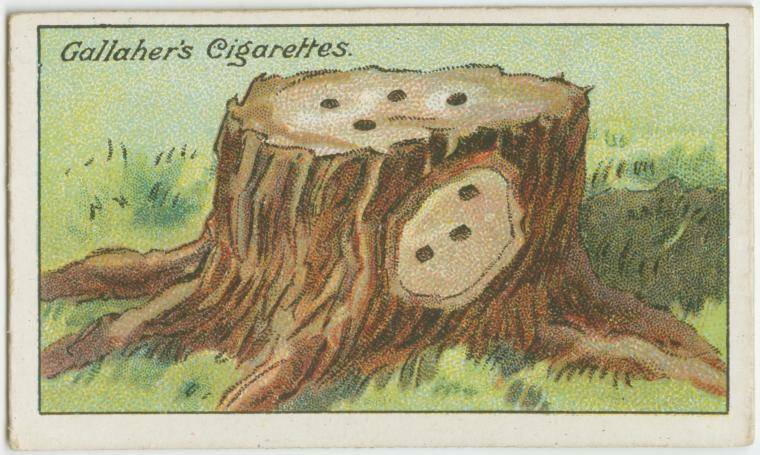 To prevent this, holes should be bored in top of stump, and a patch of marl cut from side and more holes bored there. 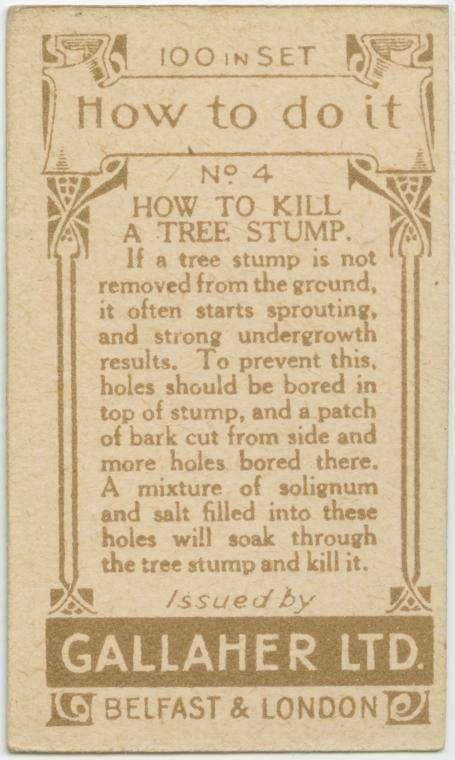 A mixture of solignum and salt filled into these holes will soak through the tree stump and kill it.